The Model Penal Code105 contains a default mens rea culpability requirement when a criminal statute is silent as to culpability. Although such a provision would not prevent the legislature from exercising its judgment to create crimes even in the absence of intent, lawmakers would have to make that judgment clear in express language. Yet Michigan lacks a default mens rea safeguard, even though its penal code has, as mentioned, eight times as many sections as the Model Penal Code. Today, 14 other states, including Illinois and Ohio, already have a default mens rea provision paralleling that of the Model Penal Code. 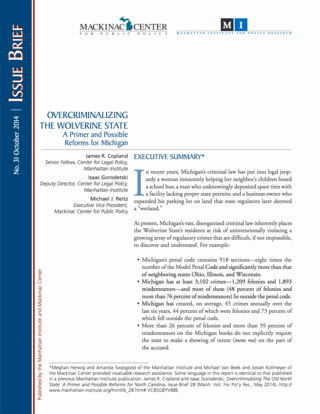 A 2013 study by the Mackinac Center reviewed landmark Michigan legal decisions that addressed the mens rea issue; the study concluded that Michigan should adopt a default mens rea provision that would apply to crimes where the legislature has been silent on the issue of intent. The legislature would be free to adopt strict-liability crimes if so desired, but if a statute failed to articulate an intent element, courts would be advised to incorporate the default mens rea standard provision. A recent decision of the Michigan Supreme Court illustrates why such a change is necessary. Alan Taylor, owner of a medical-device manufacturing company, moved his business to Sparta, Michigan, in 1998. In 2006, to accommodate the growth of his company, Taylor decided to expand the employee parking lot. The Department of Environmental Quality later informed Taylor that the parking-lot expansion intruded upon a state-protected “wetland.” Taylor disputed this finding, pointing out that environmental engineers did not note the presence of a wetland, while the DEQ’s own investigator admitted during litigation that the alleged wetland was not readily evident. Taylor was nevertheless charged and convicted for violations of the state’s wetlands protection law and was ordered to pay a fine of $8,500. [O]ur Legislature might wish in the future to review this and similar criminal statutes and communicate with clarity and precision its specific intentions concerning which public-welfare offenses … should be treated by the judiciary of this state as strict-liability offenses[.] It is the responsibility of our Legislature to determine the state of mind required to satisfy the criminal statutes of our state, and the judiciary is ill-equipped when reviewing increasingly broad and complex criminal statutes to discern whether some mens rea is intended, for which elements of an offense it is intended, and what exactly that mens rea should be. Kenneth Schumacher’s conviction, previously discussed, for the unlawful disposal of scrap tires, in violation of NREPA, further illustrates the risk in relying on courts to infer a mens rea provision when legislation is silent. The Michigan Court of Appeals found that the statute “contains no language from which it may be inferred that guilty knowledge is a required element for offending its mandate” — which can, likewise, be said for most of the aforementioned environmental, health, agricultural, and occupational codes criminalized by catchall provisions. The lack of a systematic, uniform framework in the promulgation of new laws means that the requisite mental culpability for committing crimes is often unclear and that, absent a default mens rea provision, individuals must assume that they are strictly liable for crimes that they unknowingly commit. Fortunately, at least some in the legislature understand this problem: Representative Mike Shirkey, R–Clark Lake, recently introduced legislation, House Bill 5807, to establish a mens rea default for newly enacted crimes.